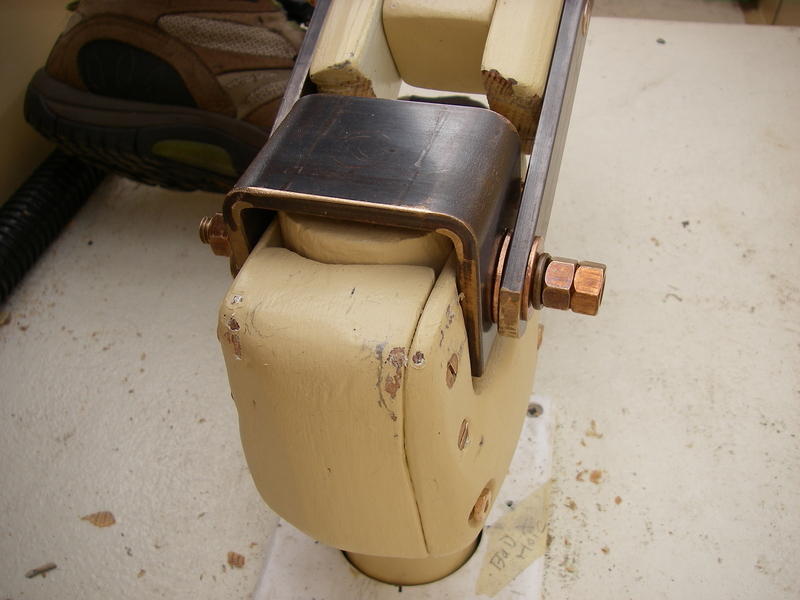 When the boat and I came home last fall, the rudder/tiller connection was showing signs of serious distress. Looking into this, and repairing it, led to addressing not only the rudder/tiller connection, but other parts of the steering system as well. The steering system, as designed for the Glasshouse Chebacco, is pretty basic. 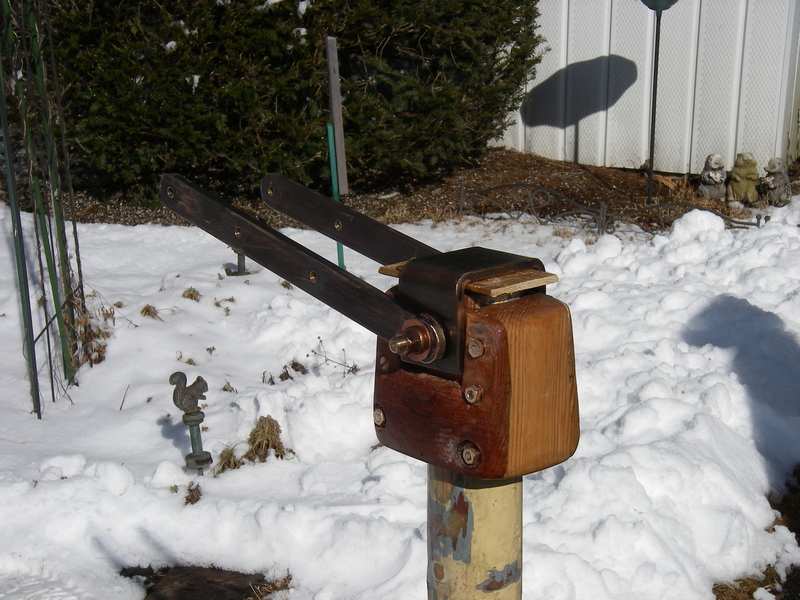 A wooden rudder, bolted to a wooden stock (what would probably be called a “shaft” if it wasn’t a boat steering part) of about 2 inches in diameter, with a bolt crossways through the top of that wooden stock, to connect the stock to stiff metal straps from the tiller. This is a low-tech way to address the subject, meant to be more accessible for homebuilders. In hindsight, knowing the kind of use to which I was hoping to put the boat, a more involved design and construction method probably would have been more appropriate from the beginning. Hindsight is so clear! The more usual system for this type of inboard rudder involves a metal stock, attached metal “fingers” where the blade of the rudder is going to go, and then the blade built out of wood or whatever else, attached to the stock and that metal frame. Because I had gotten the “sailboat parts” from somebody else (who converted his Glasshouse Chebacco to a motor tugboat), I already had a Chebacco rudder built to the original design. So that’s what we’ve been working with. 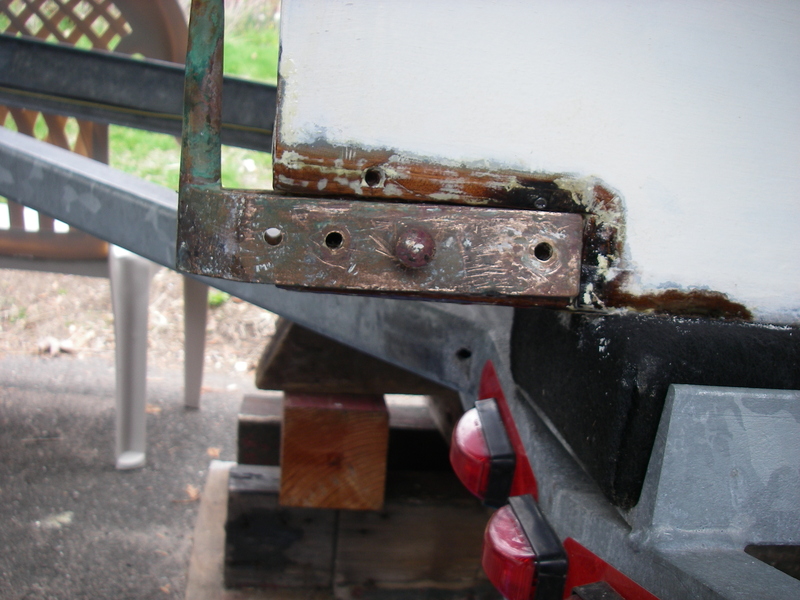 Last fall, once we had the rudder off of the boat, it was an option to build a new one, metal frame and all; in the end, doing that probably would have been more efficient, but that wasn’t clear at the time. 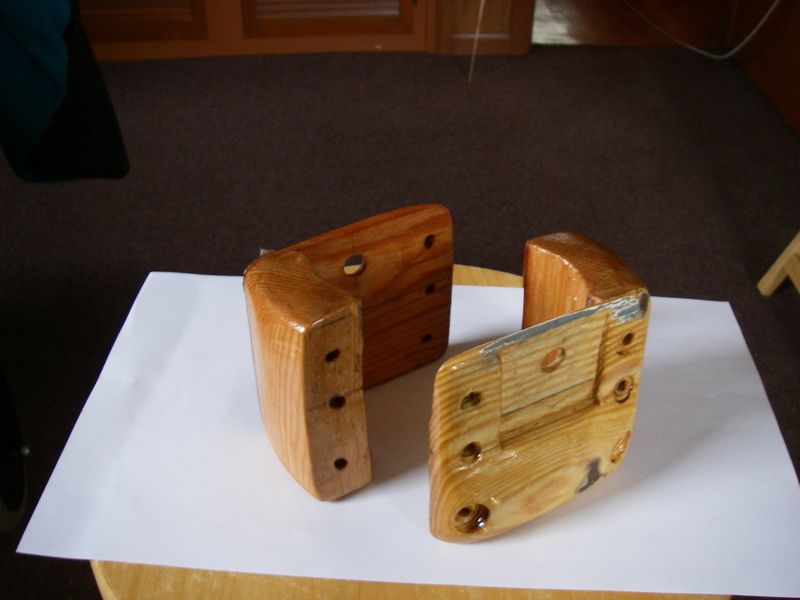 As it is, there has been wood restoration at the lower back end of the keel, under the fitting that holds the bottom of the rudder, as well as pretty involved work to restore the top of the stock, and to work out a system better than the original tiller bolt, that will still allow removal of the rudder without having to tear the wood apart. In addition, this boat has had problems with the rudder jamming against the hull, if turned too far by either human or waves. So there’s a rudder stop, at the meeting of the stock and the cockpit sole. Adding to the agenda this past winter, because of the change in the tiller connection the rudder stop has also needed to be reworked. The whole business is not yet completely finished (yup, it’s now summer! ), but the good news is that if we floated the boat tomorrow, we could actually steer it as it is right now. 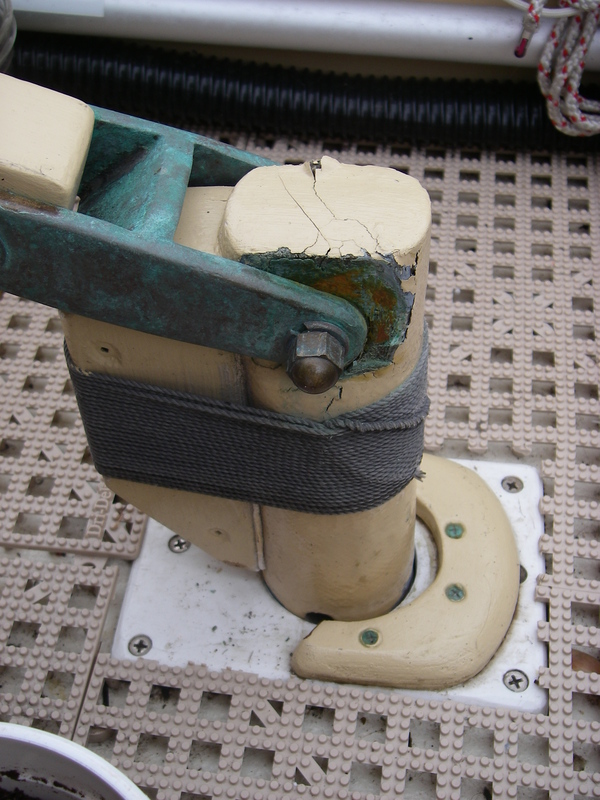 The fitting is funny – instead of a rudder “shoe” which would be bolted on to the bottom corner of the keel, so that its special socket would hold the bottom of the metal stock, the arrangement on this boat uses a pintle – an upward pointing spike that is ordinarily part of a rudder hinge. It might not make sense to go through all this description, except for that some readers might be here for the boat details – and rudder systems, for me, have been a long mystery. If nothing else, through this winter of steering rehab I have at least quadrupled my understanding of rudder systems! Maybe those systems have been the same kind of mystery for some other folks as well, so here we go. In a boat with a rudder off the stern – like both the Falmouth cutter and the Peep Hen – connecting the tiller to the rudder is not a big deal. 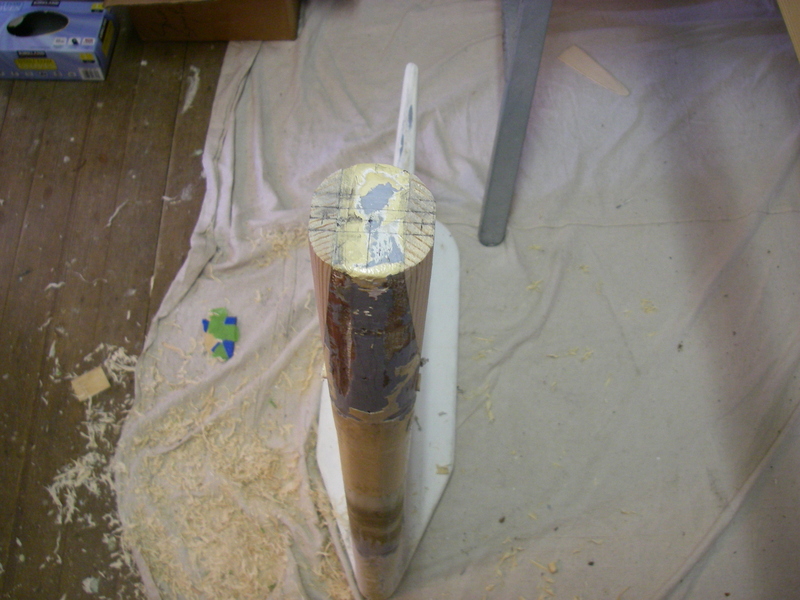 There is no stock, just an upper part of the rudder itself, with wood or metal pieces that make a sandwich for connecting the top of the flat rudder and the tiller, and some bolts to hold it all together. If you don’t like how it’s set up, it’s easy enough to strengthen it. We did this on the Peep Hen. But in a boat that carries its rudder underneath the hull, rather than attached to the back on the transom, things get more complicated. You have to have a stock (the shaft from the rudder, up through the boat, to the tiller), which needs to be basically round. (Ours is slightly oval, which is its own complication.) Then at the top of the stock there is the question of how to attach the tiller, which is a giant lever that puts great strain on that stock/tiller connection. On a metal stock, one way this connection can be handled is by using a metal cap with either flat spots on the stock and inside the cap, or some kind of key so that everything turns together. That would be so nice! 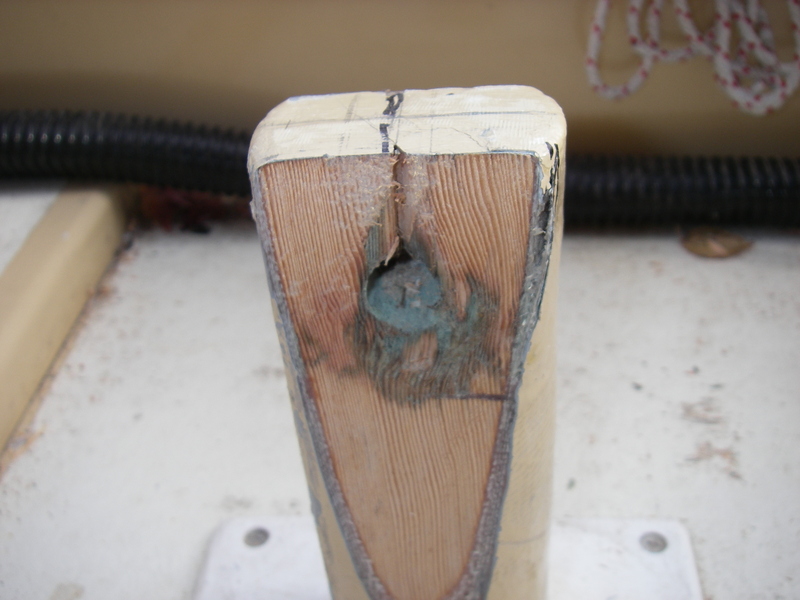 When we first launched the boat in 2012, and eventually got sailing, after a couple of weeks that included some heavier sailing conditions the original bolt arrangement wasn’t looking so sturdy. There was play where it shouldn’t be, and the hole in the wood was “wallowing,” becoming wider as the metal pin worked at the edges of the hole. In to Narragansett Bay, and consulting with the builder and a machinist he works with… adjustments were made, with a new, bigger, shouldered pin, and a slightly bigger but more closely fitting hole. We all declared it good enough for the moment, and off I went, with a couple of wrenches for occasional tightening. This held up perfectly well through the remaining 5 1/2 months of sailing in 2012, and for most of the four months last year – two trips from Connecticut to Maine, one of them almost to Canada. But by the time I was back to Gloucester, MA last year, I went to snug the bolts again, and an odd bit of wood pushed up about an eighth of an inch, right out of the top of the stock. No more tightening! Fortunately I was quite near to our haul out point, and things held together for that last week or so. This had been, after all, two heavy seasons of sailing after that initial “good enough” fix. It held up pretty well, considering! Now the task was to make a connection that would last. My original hope was for a metal cap to fit over the wood, so the pin connecting the tiller could go through holes in the cap. This might have been possible, though complicated to make, and to fit snugly to the stock. 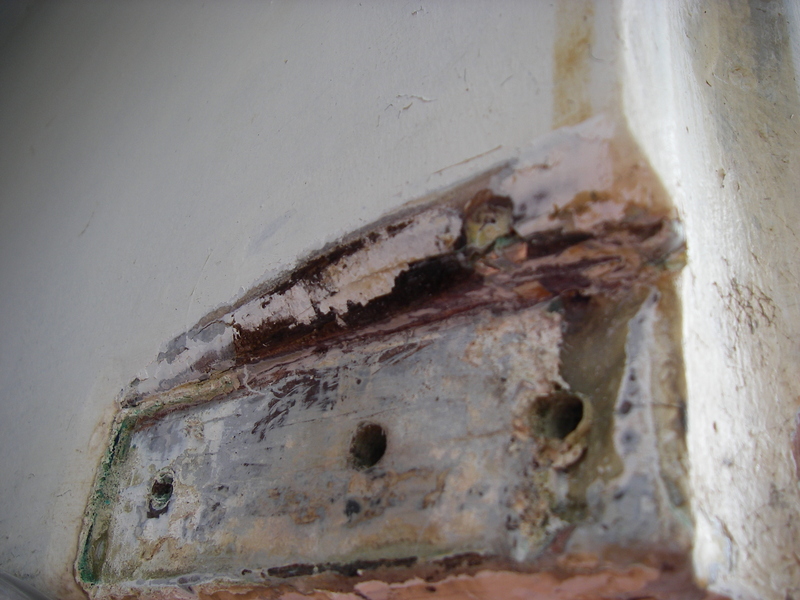 If the stock was made thick enough to adequately support a bigger metal connection, then the rudder would not be removable, as the larger stock end would not pass through the hole in the bottom of the boat. We could have gone with a smaller metal cap, but the arrangement was not inspiring of confidence, especially with the image of the deteriorated original so freshly in mind. Fortunately Theo, as I’ve mentioned somewhere before, is a high-end woodworker – an artist and sculptor who does assistant work for me a couple of days a week as her “day job.” I couldn’t be more blessed, and over these last few years her work time here has been devoted more and more specifically to woodworking. Taking on the question of the rudder/tiller connection, with the desire for the rudder to be removable without destruction, she came up with a unique solution. We have been calling it a “clamp.” I have no idea what the proper term would be. 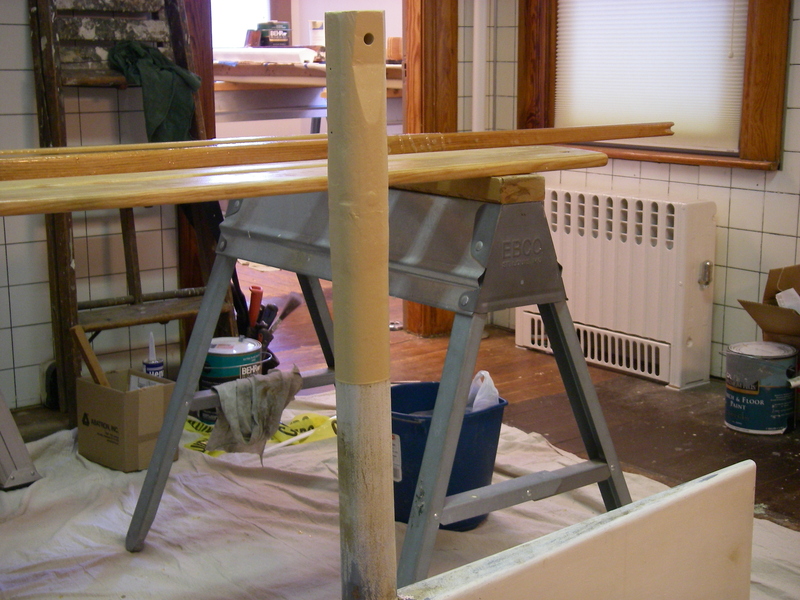 In order to make this connection really tight, first the top of the stock was repaired, with additional wood laminated on with epoxy, and then shaped. Then small wedges were added to the upper bit of the stock, to create a shallow valley on each side. The “clamp” has corresponding wedge shapes that lock into those valleys when the whole thing is bolted together. A bronze “saddle,” bent at a local machine shop, goes over the top of this to provide a sturdy pair of holes for the pin that holds the tiller straps. The pin has been machined with shoulders that match the saddle, so tightening the pin will tighten the tiller straps without crushing the wood. Lucky for us, Suzanne’s dad, Henri, has a big metal lathe in his cellar, and the skills to use it! His work shows up quite a bit, here and there on the boat. There is undoubtedly a better, more efficient, way to have solved this tiller connection problem (besides the aforementioned starting over and building a new rudder with a metal stock). But we couldn’t think of it, so now we have a fantastic, functional, and sturdy conversation piece, ready for testing, right there in the middle of the cockpit. And the rudder is indeed removable, hopefully to be used this way for many years. 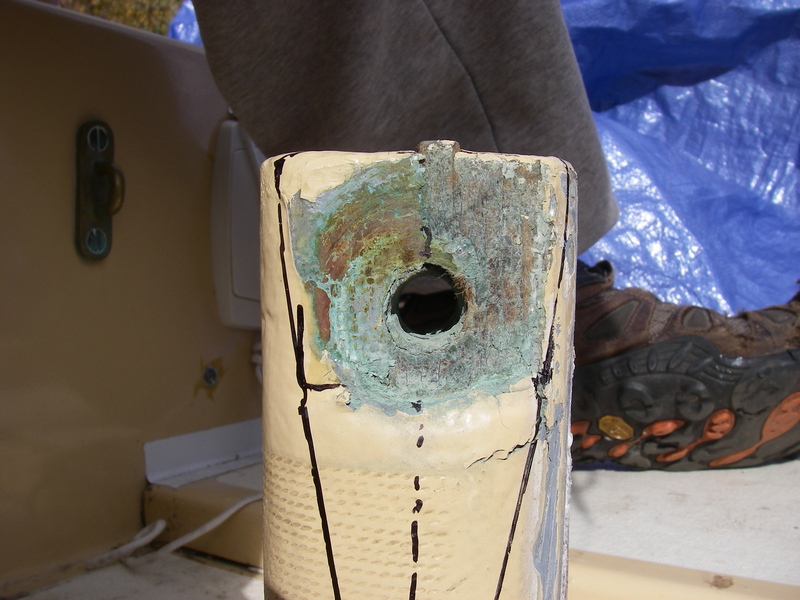 Next up: copper in the rudder tube, to discourage the (no pun intended) tube worms! Shemaya, The rudder problem looks solved. A lot of solutions, once complete, appear easier start new. Once started, tweaking and adjustments add to the engineering and construction. It also solves problems that might be repeated had not the changes been made. Your finished product is good upgrade. Hopefully this will steer Auklet smoothly in some more great adventures. Thanks for your thoughts on this – it’s a good reminder, about the other problems possibly averted. Now that we’ve actually done this job, I’ve learned so much that the new rudder option actually seems like it would have been doable. But it didn’t look that way at the beginning! With every project, you learn so much new stuff. By the end of fixing up the keel, whatever would have been involved to make the fitting for a metal stock go on there has seemed more within range. Still, it was going to have been a job to get that metal rod and frame for a replacement rudder put together by somebody. You never know how many complications will come up, with either option! Anyway, I rather like the way it’s turned out, so it’s all good in the end.